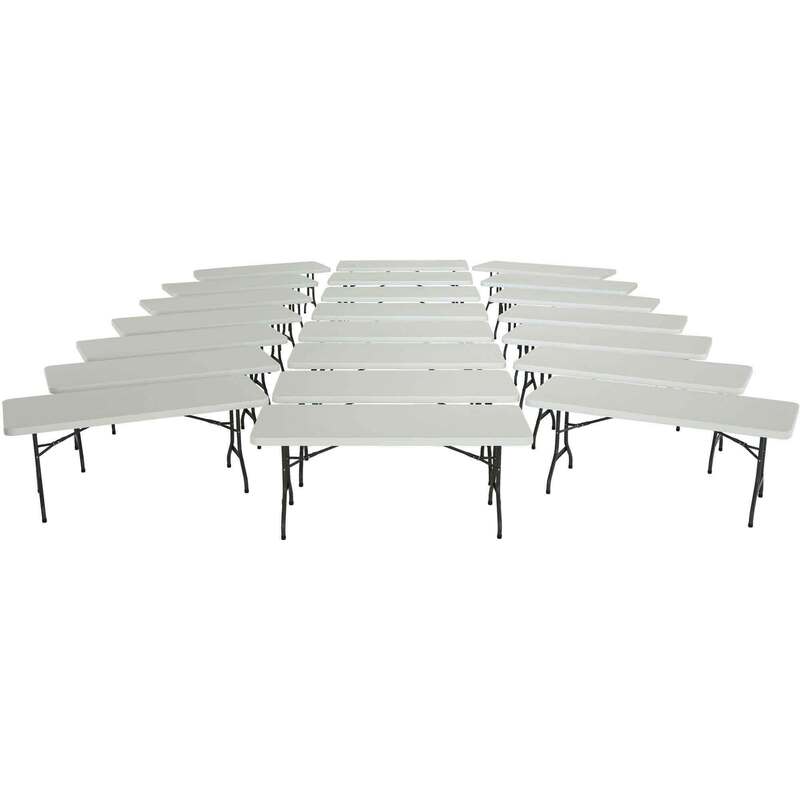 This package of 22 Lifetime folding tables provides a quick solution for banquet needs of groups between 132 and 176 people, depending on the use of the table. The 2901 table features a 72 inch x 30 inch high-density polyethylene (HDPE) plastic table top, and a powder-coated steel frame. The neutral, white granite color of the table top matches most any color needs of your room. HDPE plastic does not fade, crack, or peel, making these tables usable inside and outside. The powder-coated steel frame provides resistance to rusting. These tables are easily folded and stored. Each table weighs about 34 lbs. making them easy to transport. These tables are great for both commercial and personal use. Each table comes with a 10 year warranty from Lifetime Products for United States and Canada customers. Tables fold flat for easy storage. These tables have a solid table top with a folding frame. When folded, each table is only 2 inches thick and stack for easy storage. 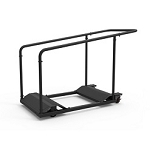 You can also get a table storage cart from Lifetime Products to help store and move your tables. The model 2901 is the exact same table as the model 2900, only a different color. The 2901 Lifetime folding table is a white granite color and the 2900 Lifetime table is almond. Almond is supposed to be a shade of tan, but has more of a gray tint to it. Model 2901 matches the color of models 2980 and 2802, among other white granite models. 22901 Lifetime Tables. You can order this table in singles here. 42901 Lifetime Tables. You can order these tables in 4 packs here. 42804 Lifetime Folding Chairs. This is the matching chair for the 2901 sold as a 4 pack. 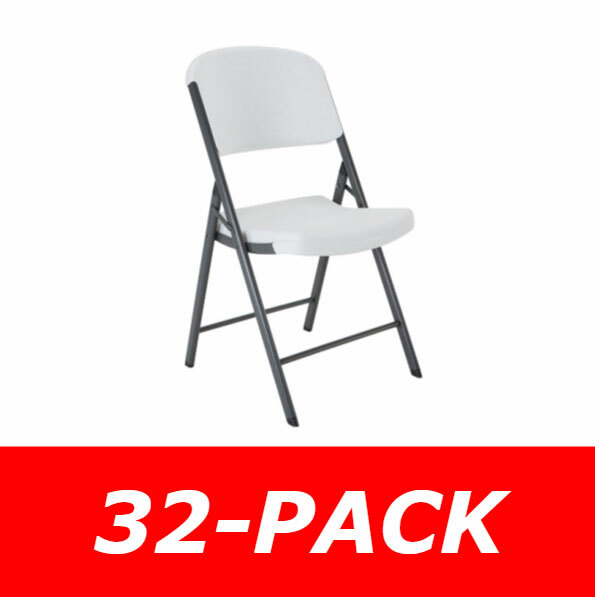 2802 Lifetime Folding Chairs. This is a package of 32 of the matching white granite folding chairs. Great seller, Very fast shipping. Thanks! Arrived today. GREAT quality for the price, Thanks! Great Ebayer, could not ask for better customer service etc. 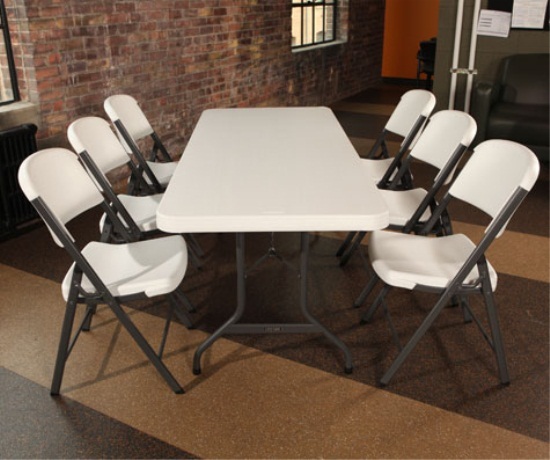 See our other listings of Folding Tables from National Public Seating, ATC, and Correll. Dimensions: 72" L x 30" W.
Color: white granite. White granite is a white color with tiny gray speckles. Major components made in the U.S.A. These are very sturdy tables and at an excellent discount when buying in bulk. best price I found after much searching. they look nice and clean easily. not sure how they will hold up through time, but initial quality is very good. We have over 100 of these tables in 6 foot, 8 foot and 5 foot rounds. In all our years I have had two problems. One was when a heavy teen was playing on top and bent center bar (our fault), and the other is the rounds occasionally lose the snap in plastic that holds the legs tight to top. (A 30 second fix) We use these tables often and hard and yet hold up. The cheaper models are fine if used for nothing more than writing or sitting against, but if you are planning on putting quantities of weight on them then these are the right choice. Lifetime continues to be the easy choice for our church: they have proven exceptionally durable and lightweight -- handling everything from fine dining events (weddings) to the [hard use] of children. We purchased four of the 6-foot folding tables. They are well made and strong, and this is a good feature since they will be in constant use in our church activities. 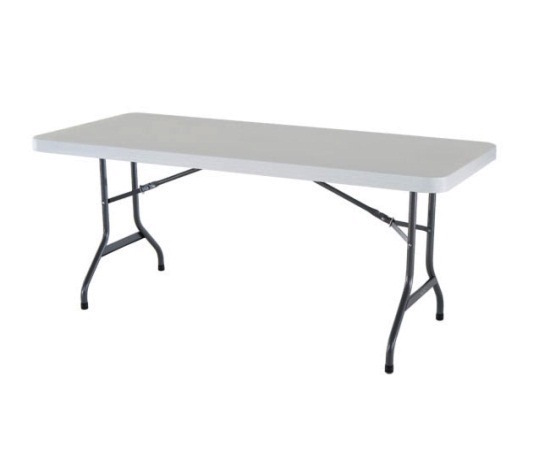 I purchased 4 of these lifetime 6' folding tables at a large home improvement store. I have used them indoors, outdoors, for gatherings and something as simple as family game night. They clean easy, are durable, and store away easily. They are safe and the legs lock in nicely. Was tired of my old table (some other brand) squishing my fingers and slamming into my leg when I put it together. I don't have this problem here. I expect to have these my entire lifetime. We ordered these tables for use in a meeting room that gets rearranged daily depending on the activity. These work great for the admins who usually do the rearranging because they are light weight and don't mark up the floors when they move them around. Lifetime 6 feet table is a good product for both outdoor and indoor setting for it weight and durability. A: The 2901 is a prepackaged pallet of 22 of the 22901's. 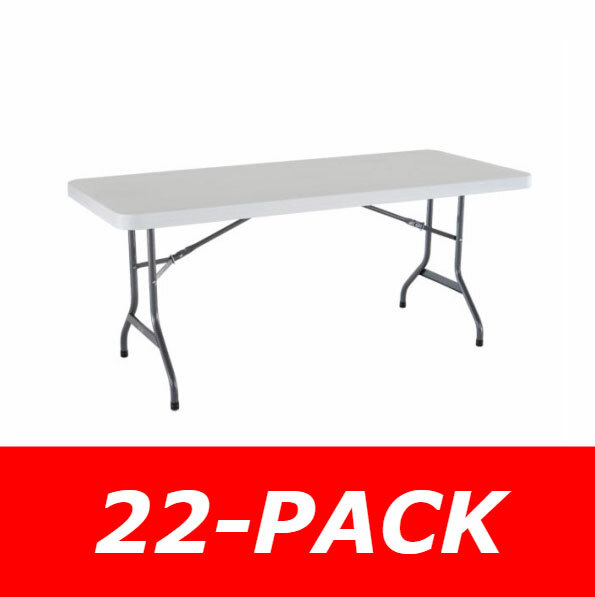 The tables in the package of 22 are the exact same tables as the single pack 22901. Q: Can I use these tables outside? A: Yes. These tables have a plastic table top that does not wear out like traditional plastics. The steel frame is also powder coated, which helps the metal resist rusting. Q: I want to use these for a reception hall / church / school. Are these tables strong enough? A: Yes. The table has a 2,000-lb. weight capacity, which is more than sufficient support for just about any conceivable banquet need. The tables are also backed by a 10-year warranty. 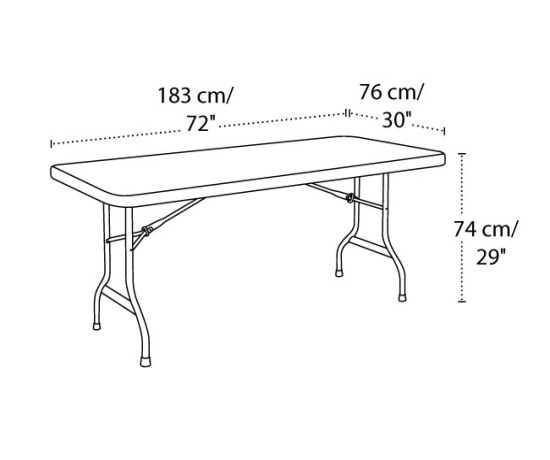 If you are still wanting more strength in the table, we do also carry the Professional Grade 6-foot Lifetime tables. These tables have a 2,500-lb. weight capacity and are backed by a lifetime warranty from Lifetime Products. Shipping! Shipments for this 22 pack generally leave the warehouse within 2 business days of ordering. The item ships from the warehouse in Clearfield, Utah via an ltl freight carrier for a curbside delivery. A curbside delivery requires the customer to be home to sign for the shipment and to move the product where needed on the delivery property. The delivery company will schedule an appointment for delivery with the customer before attempting to deliver. The customer can also contact the freight company to schedule this appointment. Dimensions: 72" x 48" x 55"